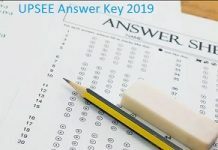 JEE Advanced 2019 Mock Test – The exam conducting Indian Institute of Technology will release various mock tests for all the appearing candidates. The JEE Advanced 2019 Mock test will be released during the release of JEE Advanced application form 2019. JEE Advanced Mock test will help the candidate understand the exam pattern of JEE Advanced question paper and the online test-taking environment. The JEE Advanced Mock test links 2019 will be provided in this article. Candidates can also check the Mock test dates here. JEE Advanced 2019 examination has been changed. The exam will be conducted on 27th May 2019 (Monday) in a fully computer-based test mode. JEE Advanced 2019 will be held in India and Abroad in two shifts Paper 1 from 9:00 to 12:00 IST and, Paper 2 from 14:00 to 17:00 IST. Joint Entrance examination Advanced will be conducted in the online mode from the year 2018 onwards. The preparation of JEE Advanced begins with part one of the examination which is JEE Main. Only those who have taken the JEE Main will be able to apply for JEE advanced 2019. Since JEE advanced 2019 will be conducted in fully computer-based mode, the candidate must take the JEE Advanced 2019 Mock Test. The exam conducting authority will make various mock tests available on the official website. JEE Advanced 2019 mock test will be made available to all the eligible candidates starting from the 2nd week of December. Taking the JEE Advanced 2019 Mock test will prove beneficial for all those candidates who are going to take the computer-based test for the first time. With the help of the mock tests, candidates will be able to have an idea of how to answer the questions in real time and also experience the environment of taking an online examination. It is suggested that the candidates take as many mock tests as possible to improve their efficiency in JEE Advanced 2019 examination. Go to the official website of JEE Advanced 2019. Click on the various Mock Test links released. (the links will be provided here as soon as they are released). You will be redirected to the page of instructions, select the language and click on the “next” button. After this click on “ready to begin” and the JEE Advanced 2019 Mock Test will Appear on the screen. The candidate will be required to take the test in 3 hours. There will be a clock on the right-hand side and will show the time remaining for the candidate to take the test. Once the allotted time is over, the exam will come to an end on its own. Candidates do not have to submit or end the examination. Answers “Marked for Review” will indicate that the candidates can go back to the questions and review them. Candidates will learn how to manage their time in the real examination. With the Mock test, the exam pattern will be made clear for the candidates. The applicant will be able to know the type of questions that will be asked in the JEE Advanced examination. Candidates will get to know which topics carry more weightage. If you have any questions related to the JEE Advanced Mock Test, do ask us in the comments section below.